Earth Day is just around the corner ( April 22 ) - an opportunity to think about how we effect our environment. A chance to change habits, go a little deeper green. Will you resolve to put on a sweater & turn the heat down, walk or bike more, choose paper nor plastic and bring your bags with you, say no to bottled water and choose refillable bottles, turn off lights when you're not in the room, compost, recycle, & reuse. Every little step helps the Earth and is more healthy for you as well. Have you considered what you use in the bedroom? No, me either. It's time we do. Natural materials are always best, that goes for adult products too. Best for your health, best for the environment. EdenFantasys offers a wide selection of eco-friendly toys. With materials such as wood, ceramic, glass, steel ,and stone. You'll find rechargeable toys, biodegradable toys, eco-conscious manufacturing. 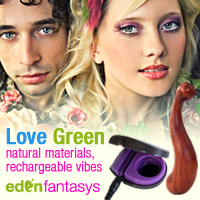 So this Earth Day, enjoy yourself & do something good for the planet - shop EdenFantasys!